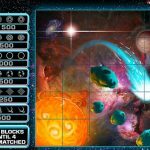 Starscape is a Microgaming video slot game with a cosmic theme. On the reels of the game you will be able to go deep into space among the stars, where you can see new planets and worlds unveil before your eyes. The slot has a futuristic look with great symbol details and decent animations. The game play in the slot is fast and the choice of colors perfectly fits the overall game theme. 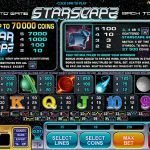 The Wild symbol in the slot is the Starscape Logo. The wild comes with a maximum payout of 7.000 coins or 70.000 coins if you are playing with the maximum coins per bet line. He will substitute for all of the game symbols except for the scatter and can land on all of the reels. But the best detail about the wild is that he will double any payout he contributes in, thus significantly increasing the symbol payouts. The Scatter symbol in the game is the Space Ship. He can land on all reels and offers a maximum payout of 100 x stake if 5 of them land on the screen. He will also trigger the Starscape Bonus game if 3, 4 or 5 of them land on the reels. In this feature you are taken to a separate screen with 25 blocks displayed. Behind 24 of the blocks are six different symbols, while one block holds a x3 multiplier. The goal of the game is to match four of the same symbols. Once this happens they will award a coin prize and if the multiplier is uncovered the prize will be tripled in size. Players can win up to 37.500 coins in this bonus game. 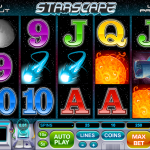 Starscape is an interesting Microgaming slot with an attractive game theme. The visual effects are great and the slot has an attractive bonus feature which can produce payouts up to 37.500 coins. Do you like playing or watching soccer? You should consider playing Soccer Safari a 5 reel slot by MicroGaming.